A Little Blueberry: Bendi Baby Yoga Mat Review & Giveaway! I am so excited to be hosting another giveaway this month! This one is for a Bendi Baby Baby yoga mat - these mats are awesome! Scroll down to read my review and see how you can win one! Brooke, the co-owner of Bendi Baby (along with her husband), is awesome to work with and if you follow her Instagram she just shines through as such an amazing soul. Her, her husband, and her two kids, Sage and Rumi, run the company themselves and host Instagram "get-togethers/challenges" called Family Yoga Lifestyle (#familyyogalifestyle). Brooke has a Master's in Child Development (which the teacher in me loves), studied yoga and was a midwife who delivered babies - so this chick knows about kids AND yoga. She seems to raise her kids in a very free-spirited, kid-centered, "live life to the fullest" style and I just adore her positive messages and energy (that come through even on Instagram and Facebook). 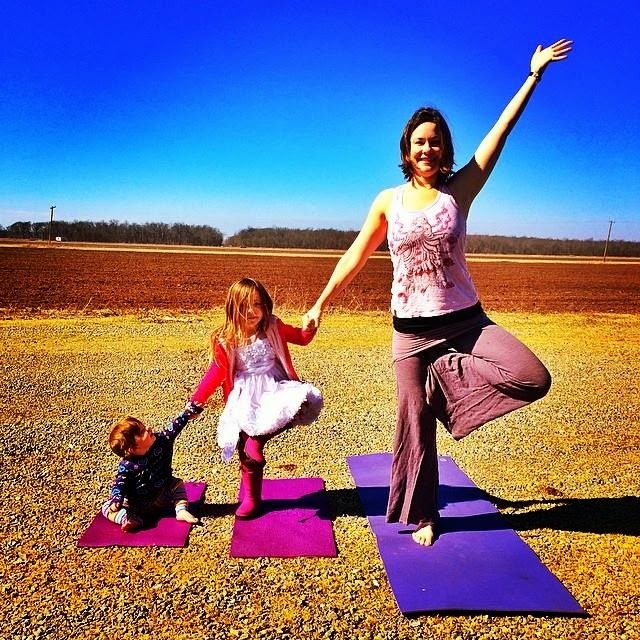 Brooke has a ton of videos/pictures on her Bendi Baby website and you can tell that she is really passionate about her yoga mats and wants to share them with other yoga families. After seeing Brooke's page, going to their website and emailing with her, I just knew I wanted to work with this company. I also knew that I HAD to get Lemon one of these mats! Lemon does down dog all over the house, all the time, but will never do it with me when I do it or ask her to. But, the day we got our Bendi Baby mat in the mail - I rolled it out, said "down dog," did mine and Lemon accompanied me (picture at top)! It was so cool! It's like she was just waiting for a mini mat of her own! And do you remember these pictures that went viral a couple of months ago? 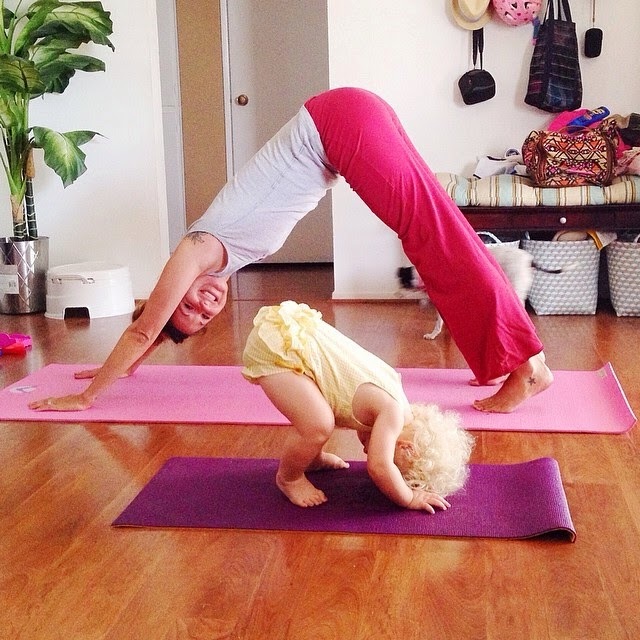 This mama, Laura Kasperzak, and her 4 year old daughter, Mimi, practice yoga together and take the most beautiful pictures, and featured a Bendi Baby yoga mat in a couple of them! Winners will be chosen at random on Wednesday, May 14th at 8pm MST. If you win, you will receive a Bendi Baby baby yoga mat! Good luck!! Following you on Blogger, and love reading your posts! Would love a baby yoga mat to focus some of my son's energy and do some exercise together. Just think it would be the cutest to do some warrior poses with my baby boy! That video of you and Lemon is ADORABLE! I have just started working yoga back into my routine and if I dare run through it while the babes are awake, I inevitably end up with at least one baby on my mat! 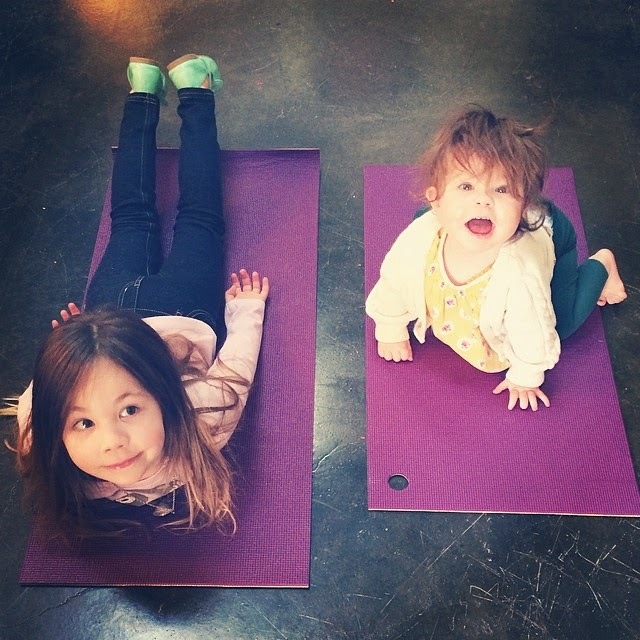 With two under two a baby yoga mat would be sure to get a fair amount of use in this house! I would love to win a baby mat, to help show my babe the benefits and fun of a yoga practice, and to help me make practicing together a priority. I would love a mat! My two year old son absolutely loves yoga and always steals mine! It would be great for our practice! I hope it keeps my 3 year old on the mat! is that too much to ask? he likes to get out all 3 and use them all! I have watched you and lemons video. it's really enjoyable also lemon is looking attractive.